Helen Young directs Feinstein’s Research Program on Nutrition, Livelihoods, and Conflict. She has led several multi-year research programs in the Horn of Africa, especially in Sudan and Chad, involving national and international partners and multi-disciplinary teams. Her research on building resilience of people in conflict-affected regions aims to bridge the gap between local realities, policy, practice, and research. She is committed to fostering professional networks that span academia, civil society, government, and non-government organizations to promote shared understanding of complex problems. In Sudan her research tracking pastoralist livestock migrations in real-time seized the imagination of senior policy makers and has influenced politicians, policies, and resource allocations in Sudan. This work provided scientific evidence of the environmental principles underpinning pastoralists’ successful adaptation to the unpredictable distribution of rains and pasture in this semi-arid region and the rationale for pastoralist mobility. For 25 years Helen has researched nutrition in emergencies, influencing UN technical guidelines, the IPC nutrition and mortality indicators, Sphere Minimum Standards of Disaster Response, and INGO practical guides. Helen has been the co-editor of the journal Disasters since 1997 and is on the Editorial Board of the Food and Nutrition Bulletin. She is an active member of the Action Contre le Faim (ACF) International Scientific Committee and a member of the Advisory Group to the Humanitarian Policy Group, Overseas Development Institute. She is the author of more than 60 publications. 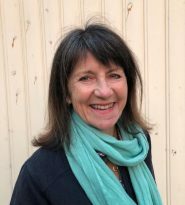 Prior to joining Feinstein, Helen worked with Oxfam GB as an Emergency Nutritionist and Senior Nutritional Advisor in Somalia, Kenya, Ethiopia, Burundi, North Korea, South Sudan, and Sudan. She has also worked as a nutrition consultant with the World Food Programme, Unicef, UNHCR, FAO and the World Bank. Helen received her B.Sc. in nutrition and food science from Oxford Polytechnic, and her Ph.D. in food science from the Council for National Academic Awards, UK. She lives in Twickenham, England with her partner Rob, her two sons, and their dog. The drivers of acute malnutrition and their seasonal patterns. The adaptation and transformation of farming and pastoralist systems in conflict affected semi-arid regions. Innovative mixed methods for promoting shared learning and building capacities, through multi-level research partnerships. Young, H. & Jacobsen, K. “No way back? Adaptation and urbanization of IDP livelihoods, Darfur 2006 – 2008.” Development and Change 44, 1 (2013). 125-145. Young, H. & Jaspars, S. “Review of Nutrition and Mortality Indicators for the Integrated Food Security Phase Classification (IPC) Reference Levels and Decision-making. A study commissioned by: The SCN Task Force on Assessment, Monitoring and Evaluation, and The Integrated Food Security Phase Classification (IPC) Global Partners.” (2009). Young, H., Osman, A., Aklilu, Y., Dale, R., Badri, B., Jabbar Abdullah Fuddle, A. “Darfur – Livelihoods under Siege.” Medford, MA, USA: Feinstein International Center, Tufts University. (2005). Young, H, Borrel, A., Holland, D., Salama, P. “Public nutrition in complex emergencies: Aims, analysis and action.” The Lancet 364, 9448 (2004). 1899-1909. Lautze, S., Aklilu, Y., Raven-Roberts, A., Young, H., Kebede, G., Leaning, J. “Risk and Vulnerability in Ethiopia: Learning from the past, responding to the present, preparing for the future.” Medford, MA, USA: Feinstein International Center, Tufts University and Inter-University Initiative on Humanitarian Studies and Field Practice. (2003). Marshak, A., Young, H., Bontrager, E., Boyd, E. “The relationship between acute malnutrition, hygiene practices, water and livestock, and their programme implications in eastern Chad.” Food and Nutrition Bulletin 38, 1 (2017). 117. Young, H. & Goldman, L. eds. Livelihoods, Natural Resources, and Post-Conflict Peacebuilding. USA, UK, Canada: Earthscan from Routledge, 2015. Young, H., & Maxwell, D. “Participation, political economy and protection: food aid governance in Darfur, Sudan.” Disasters, 37, 4 (2013). 555-578.